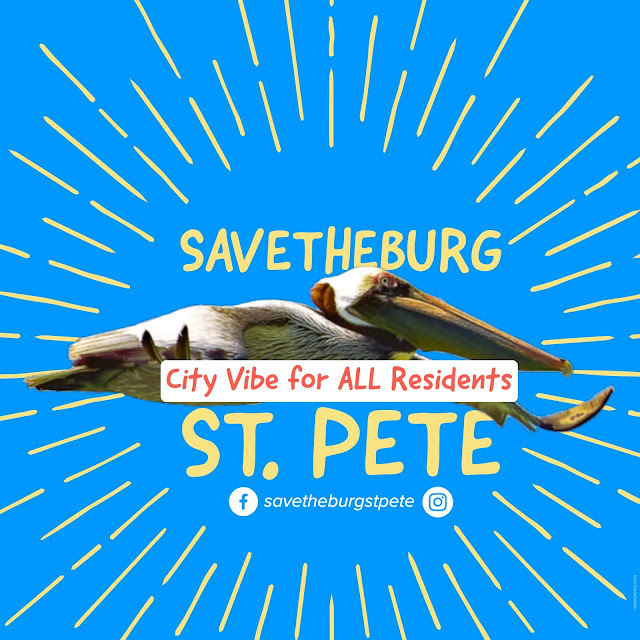 BAY POST INTERNET: Bars say they want to work with residents on the noise, but it's lip service in St. Petersburg! Bars say they want to work with residents on the noise, but it's lip service in St. Petersburg! Efforts to work with the bars are temporary at best. Jannus Live is one example. In the April, St. Petersburg's Public Services and Infrastructure Council Committee meeting, Mr. Foster stated Jannus Live wants to work with the community and is relooking to dampen sound. However, Jannus Live needs to be transparent and reach out to the neighborhoods. All bars need to reach out to the neighborhoods! This entails reaching out to not only the neighborhood associations but the individual apartments and condominiums. This is because some neighborhood associations do not include everyone in their community. 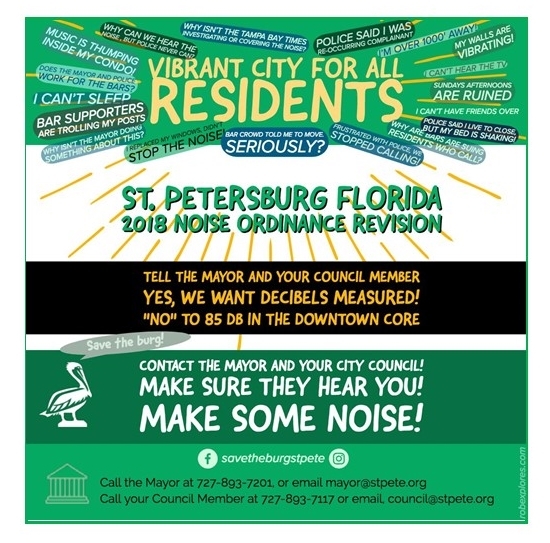 If the City is serious about providing a balance in the quality of life, then the City needs to ask Jannus Live to show the public, especially the neighborhoods and Downtown Residents Civic Association, the Live Nation contract that specifics the decibel levels the band and sound engineers are to maintain. If there are not any decibel level contracts, then both the City and residents need to be concerned. The City should survey all the bars to understand if they have decibel requirements in their contracts. This would be a good faith outreach for both the City and the bars. Jannus Live uses Live Nation to book acts. Live Nation was recently involved in a noise incident in Nashville at the Amphitheater. According to the article in Tennesean, Live Nation: Beck Kept decibels down at Ascend Show that sparked east Nashville complaint, Live Nation does have decibel limits in the contract. Live Nation will fine the act if it exceeds the limit. It was also stated humidity was high that night and caused the sound to travel. The concert was heard a mile away in a residential neighborhood. The amphitheater experienced the highest call volume since the Janet Jackson performance. St. Petersburg’s humidity is worse than Nashville. In St. Petersburg, do the sound engineers consider humidity? Police do not understand nor are they trained on how humidity impacts noise. The noise ordinance's "Plainly audible" standard does not provide a quality of life. That is why the decibel standard are the only solution that residents can support. If the bars want to work with residents, then the bars need to install sound monitoring equipment on the perimeter and at the sound board AND share the data with neighborhoods. In addition, the City needs to install sound monitoring equipment in the area. Instead of ignoring resident's quality of life and gadlighting residents, the city needs to be proactive when it comes to resident's quality of life. When The Landing at Jannus opened, there 5 calls to report noise with a three month time span. The police was in the resident's bedroom and confirmed the vibration. Police had repeatedly asking Jannus to turn down the music and Jannus did that night. But resident had to call again. The city researched the noise ordinance and found the resident was too close. The Police did not alert City Council to say, this doesn't seem right to you? 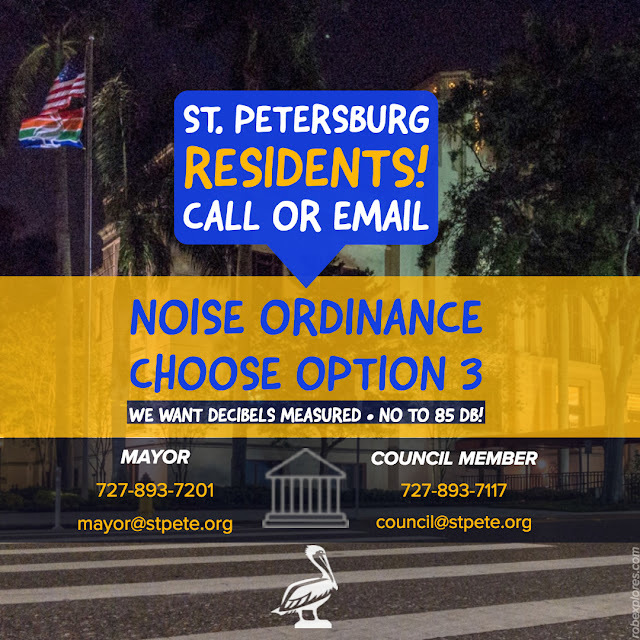 For more information, read Noise calls located at 201 1st Avenue North in st. Pete's Downtown Core. Time and time again, Mayor Krieseman, the Police, and city Council have not been looking out for resident's quality of life in their home. Why doesn’t the City have sound monitoring equipment like Nashville does. If St. Petersburg wants to compete with Austin, Nashville and Denver, then the City needs to have sound monitoring equipment. Again, bigger question is, Why doesn’t the bars and the City have it now? What can you do to ensure City Council changes the Noise Ordinance to provide a better quality of life for residents?